The Kickstarter website provides a way for those with "ideas" to get financial contributions from individuals who would like to help bring those ideas into reality. What kind of ideas? Well, Kickstarter lists the following categories on its front page: Art; Comics; Dance; Design; Fashion; Film & Video; Food; Games; Music; Photography; Publishing; Technology; and Theater. I note the absence of a "politics" category. Maybe I should work on that one. Oculus VR (for virtual reality) is a company that used Kickstarter to raise money. The company apparently raised quite a bit. Then, those in charge of Oculus VR sold the company to Facebook for $2 billion dollars in cash and stocks. The net value of Facebook is on the order of $159 billion dollars. What about those Kickstarter investors, or contributors? They got nothing. Of course, they weren't promised anything, either. The fact that Oculus VR took money from people without a lot of it (in most cases), and then used that money to put the actual owners of the company in a position to become multi-millionaires, has generated a lot of controversy. Lots of contributors are "pissed," to use a technical term. Others defend the Kickstarter experience, as evidenced by the Oculus VR example. The supporters say that Kickstarter funds "hope." I am all for hope, and Kickstarter is a website that allows just about anyone to ask for money, and to "hope" that people will give it to them. 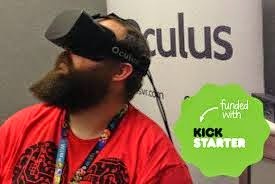 Obviously, you need a good "pitch" to get money out of Kickstarter, and the people who put together the Oculus VR Kickstarter campaign clearly did a good job pitching the product. I'd say they did a good job on Facebook, too! Point here? Keep hope alive, but if what you are really doing is making an "investment," as opposed to making a contribution to those who will soon be among the 1%, you might want to get something for your money. And if you think you should get something for your money, so you don't end up subsidizing business owners and helping them to become multi-millionaires, get it in writing! Um, I think the point of funding a project on Kickstarter is to be able to sooner become a *customer* who buys that product, not personally profit by the invention. Have you mistaken Kickstarter for an exchange market?